India’s 2nd largest car maker, Hyundai has come up with new offers for its customers on the occasion of Diwali festival. The Diwali offer is available across all its range of cars including Eon, Grand i10, Xcent, i10, Verna, Elantra and Santa Fe. This limited period offer is valid only till 11th of November. 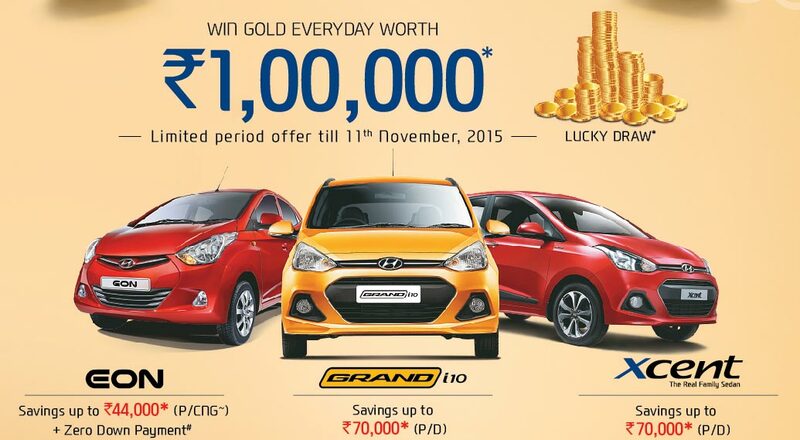 When you buy the new car, you would get a chance to win gold everyday worth INR 1,00,000. The winner of gold is decided through lucky draw. On purchasing Hyundai Grand i10 there are savings benefit of up to 70,000 INR. Hyundai currently has 1146 nationwide service outlet and 897 sales points across 670 cities in India. Would you be buying Hyundai cars for this Diwali? Let us know! What to expect from Datsun Redi-GO?